Despite all attempts at cleaning it you cannot will yourself to organize your sewing room. Cluttered from top to bottom with loose threads, scraps, and rogue needles, you find yourself feeling overwhelmed instead of relaxed when you enter this space. 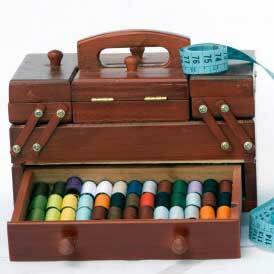 Lucky for you, that chaos can easily be managed thanks to the Square Sewing Box from Everything Mary. This ingenious design allows for a significant amount of storage space without taking up too much room in your sewing room. With a practical square body and dome top, you can fit anything from needle packs to rotary cutters inside this box. Keep track of those random spools of thread which you always see but are nowhere in sight by filing them away in Everything Mary's perfect room accessory. The removable tray not only allows you to stack smartly, it is clear so that you can easily navigate around this organizer. As for those patterns you can't keep straight, the inside of the domed lid includes a pocket that is perfect for keeping loose papers in order. Breathe easy, because the next time you walk barefoot into your sewing room you won't face the possibility of stepping on a straight pin. Even if you don't have a pincushion to put inside this box, the design itself offers pin and needle space underneath the lid. With a sturdy handle, you can tote this sewing box with you around the house so that you can spend less time minding the mess and more time creating with ease. This post contains sponsored links from Jimmy Beans Wool. Our Disclosure Policy can be found here.